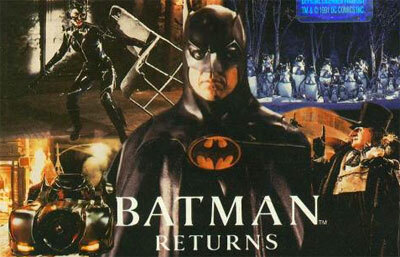 The successful movie sequel Batman Returns spawned many different game adaptations. The SNES version presents the story of Batman's encounter with the Penguin and Catwoman as a side-scrolling beat'em'up, with one Batmobile driving sequence thrown in. There are two varieties of the beat'em'up levels. One plays like Final Fight and similar games: Batman can move in two dimensions, beating up his enemies with various punches, kicks, combos and special moves. Special gadgets to be used include the famous Batarang to take out enemies from a distance and "Test Tubes" filled with chemical explosives which will damage all enemies on the screen. In the second type of side-scrolling level, Batman can only move in one dimension, left or right. The Batarang is the standard weapon here, with punches only being used when the enemy gets close. Also in these levels, Batman can use a grappling hook to cross dangerous areas unharmed.